[360Lizard] SD Files V2.00c - Firmwares & Tools - xboxhacks.de - Deutsches Xbox 360 und One Forum für News, Hacks & Co. 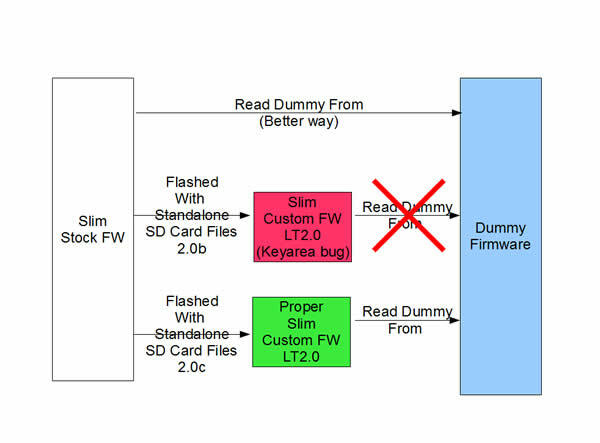 If you flashed a Slim Drive with Standalone Mode using the previous SD FILES PACK (2.00b) Don't Read back the Dummy.bin file from the flashed firmware. Instead of it use the Original Dummy.bin file first read from the drive when it was on stock. The reason for this is we spotted a problem (thanks to kombatace for pointing) on the last SD FILES pack (2.00b) that will result in the flashed firmware not working. This bug only affects Standalone flashes made to SLIM drives. If you flashed your drives with TBX+Lizard then you dont have to worry at all. c) Important, DONT READ AGAIN THE DUMMY TO A SLOT OR TO THE PC from the already LT 2.0 flashed drive.